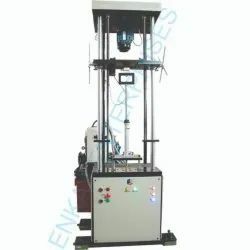 Pioneers in the industry, we offer shock absorber damper testing machine from India. A dampening force of a shock absorber is directly proportional to velocity and this parameter needs to be precisely controlled. A small variation of 1mm in a stroke of 100 mm for 100rpm can result in a variation of 10% in dampening force. Dampening force can be evaluated in the field orientation i.e. Vertical or Horizontal or at any angle between horizontal to vertical and can be locked at any position as per requirement.